Wow, i adore the colours on this card, totally yummy! If you could drop me an email with your details on hun I'll drop it in the post for you. This reminds me so much of my 2 girls when they were children, they were never happier that helping me with the housework, in fact Natalie had a little toy iron and ironing board that she used to drag out, she always got the tea towels and the dusters to iron whilst I got the dreaded shirts, ha ha. I shaped the corners of the white card with a circle punch, I just judged a quarter circle cut by turning the punch upside down so that I could see where it would punch out the card. I coloured the image with Promarkers and then stamped the white image with red ink, tiny flower stamp and a fancy border stamp. 4 pearls 1 in each corner a couple of pretty ribbons, faux stitching around the card with a white gel pen, a Prima flower and a bit of love went into making the card. Cinderella is one of many digi stamp images by Mo Manning it can be purchased at Digital Pencil Too. If you would like this card leave me a comment and I'll do a draw for it. My little girl, she is 19 month old, like sweeping with me after dinner. This card lust like her. Good job on colouring. Beautiful card, the colours and image are lovely... when my children were little they too had an iron & board and used to 'help' me with the ironing... you brought back some happy memories to me - thanks. Such a sweet image, and the colors just make it happier! Love it! What a great card and cute image! I wish my kids still liked to help out like they did when they were little LOL! Jak... this is out of this WORLD amazing!!! LOOOOOOVE the layout, the papers, and most of all, your AHHH-mazing coloring on this little sweetie! WOW WOW WOW!!! I just love Mo's images! You have done an amazing job with this one! 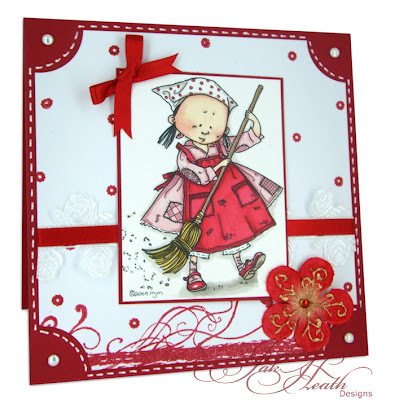 Another gorgeous card, just love the image, and the colours are perfect! Your card is so cute. I love the colours you've chosen! Great colours you've used here Jak. I love this cute image. Beautiful Jak, you can't fail to love Mo's images. Totally FABULOUS card as always! Someone will be SO excited to win it. Beautiful card Jak.The red and white isso fresh. Gorgeous card Jak. Love the red, it really hits you in the face lol. Aaahhhh, how sweet is she? Another gorgeous card Jak. This one is fantastic, Jak. Love the red and white colour combo and the image is great. It's a shame theres not one of a wee boy because Wee Steven loves to help me with mine, lol. Oh what a cute card Jak...I love the image and the colours you have used. Just perfick! You have coloured this lovely image a treat. Oh wow Jak, this is adorable and my favourite colour RED, I do so love this image, super sweet. The image is so cute..The colours you`ve used just makes it pop. great card jak, love the colours. ah those were the days when helping with house work was fun not for the pay out at the end !!!! Beautiful card I just adore it, the colours you have used are fab and the use of the corner punches and the faux stitching really inspiring. 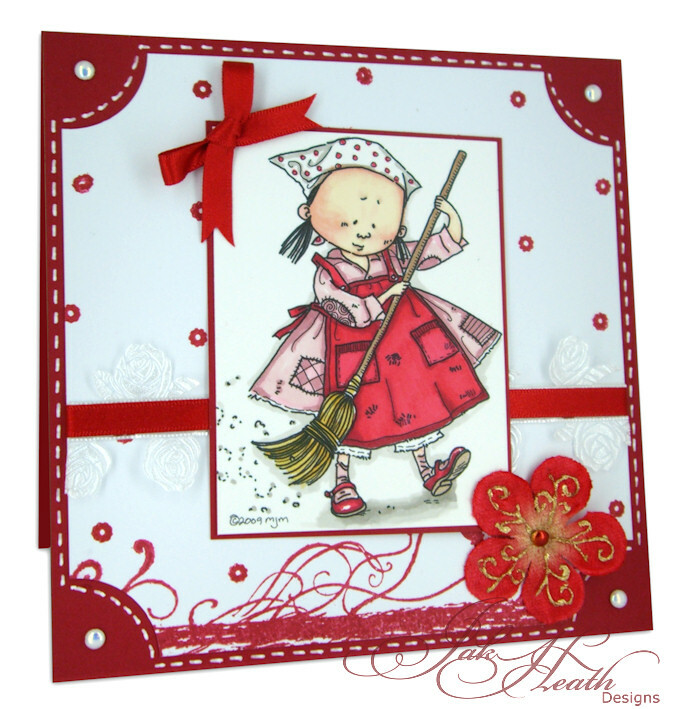 Oh, what an adorable card and in my favorite colors as well. This card is so cute... I love your colour choices & your colouring is perfection! Oh yes, would I love to win this card. It´s gorgeous, and just the most ownderful colors too. And it just reminds me sooo much of my 6 granddaughters too, who´s all the same as your girls was ha ha ha. Aawww, Cinderella looks worried to me, it must be the ugly sisters giving her grief. If your daughter is still up to ironing I can package mine and send it for her to do. Beautiful card. Nice coloring and colors. This card reminds me of me when I was young. My job was to sweep the floors every morning before school. There are so many There are so many Bo Manning Digi Stamp Images that I want. Gorgeous card, Jak. The coloring is terrific also the layout. Fabulous card Jak, love the colours you've used. I like the color scheme of the card, even though the motif is by far too cute for my taste. Wow Jak, Lovely card and what a great colours. It's diffucult to work with red but you've done a great job with it. Oh Jak I love everything about this card. The images is gorgeous. Love the colours and the way you have gel sitched round the design. I truely fabulous card. Well done. I like very much the use of the decorative corners - really highlights the bold red. I've never used the Prima flowers before and now I'm feeling inspired to get some! Fantastic image Jak and you have coloured her to perfection. Love what you have done to the corners it really sets the card off. Jak!!! What can I say??? You did a fantastic job with this Mo´s image!!! Your card is absolutely adorable. it seems to me that red is not your usual color, if I don't have a bad memories. It comes out gorgeous.Love it. I love this image - and most things Mo. What a great layout too! beautiful card! I love the image it is so cute! mmm... my favorite colors - red and white!!! beautiful girl! I just love the colors you used for this card! The image is adorable and you did a wonderful job of coloring it! this card makes me smile. Love it. Awww this is so cute and what fab colouring. Love the red and white combo, it's beautiful. ... and what an idea for the corners. I did mine once with a scalloped scissors! Oh isnt' she just cute? Love the vivid red shades and the sweet image. Lovely, again! I could do with her coming to my house!!! She is so sweet. Beautiful card! Mo's images are just the best aren't they!